In August 2013 a research programme was undertaken amongst staff, patients and carers to understand how both groups perceived the way the hospital and its staff worked and to measure any perception gaps. The results enabled a creditable framework of values and behaviours to be produced, crucially chosen by the staff themselves and therefore maximising the likelihood of successful implementation and subsequent improvements to morale and patient care. WDAD devised a distinctive creative campaign (which avoided the usual clichéd ‘NHS’ images). to communicate the new values and behaviours and to help employees understand and embrace them. 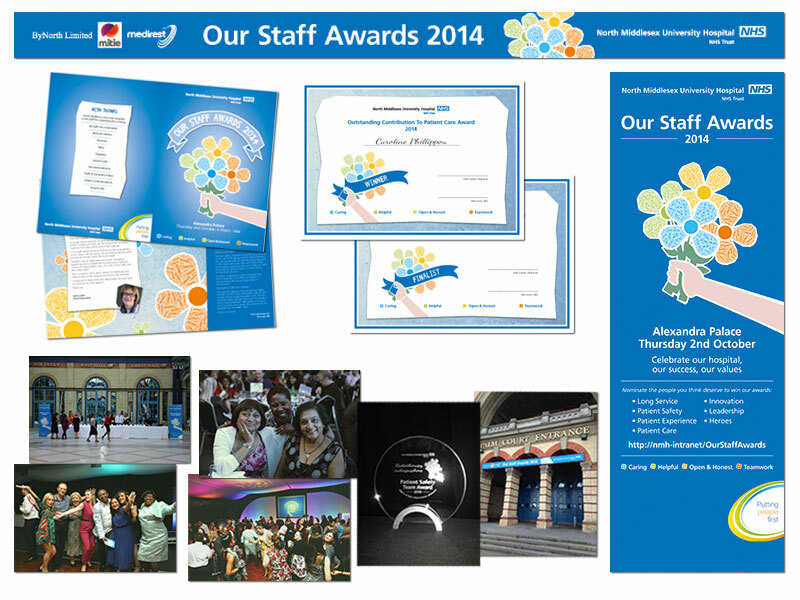 The agency managed the campaign’s roll-out, initially culminating in the Trust’s first Employee Recognition Awards. The biggest landmark so far has been the Trust’s first Employee Recognition Awards, held at Alexandra Palace on October 2nd 2014. WDAD project managed the event, encouraging employees to nominate colleagues who best demonstrated the desired values and behaviours. Over 200 nominations in 10 categories were received. Nearly 350 shortlisted candidates, colleagues and sponsors attended the awards. The night was a true celebration of the best of the Trust; great employees who are caring, helpful, open and honest. Employees that join together to make one exceptional North Middlesex University Hospital team.